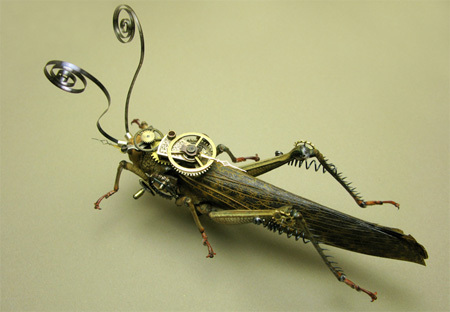 Mike Libby makes amazing Steampunk inspired sculptures by combining real insects with mechanical parts from antique watches. 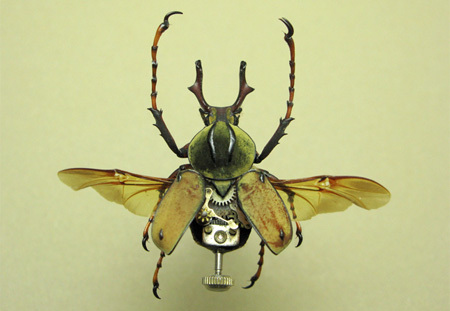 Unique art created using non-endangered specimens from all around the world celebrates the contradictions between technology and nature. @Ninja Egg :D Ewgh. I hope no one does that to people! That would be too disturbing.. It would be really gross/creepy with animals actually. ex. dogs, gerbils,.. zebras… ugh. Hope they dont do that.. 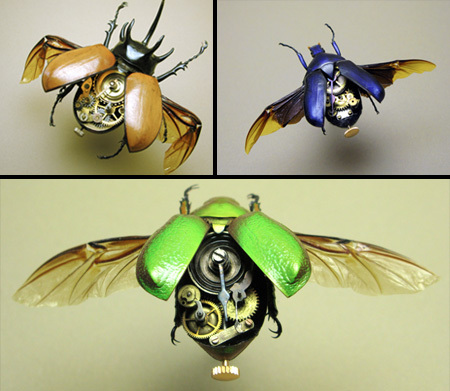 Bit sick doing that to real bugs. 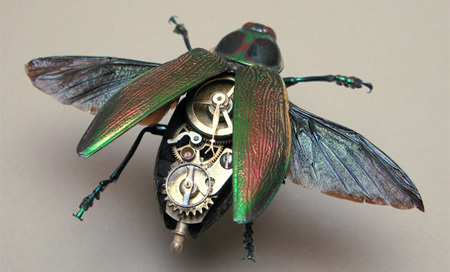 Insects wearing watch parts. 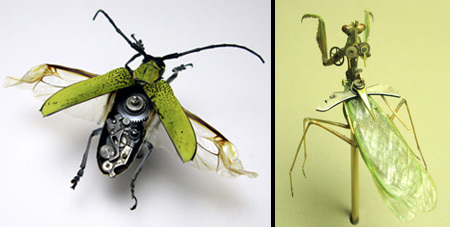 My take was that human technology has a way to go to compare with the complexity of nature. 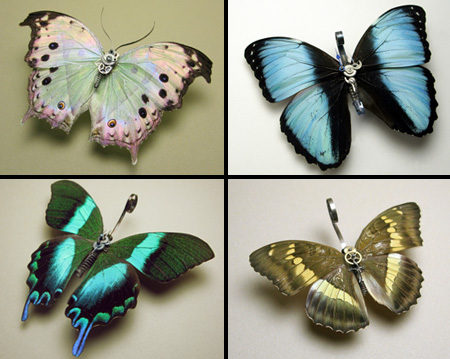 I find these a little disturbing… eugh. Step 1: Get dead bugs. Step 2: Glue random clock pieces to them. 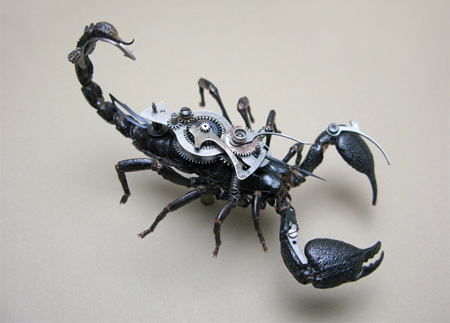 Technically a scorpion isn’t an insect, but it is my favorite. They are arachnids, like spiders. 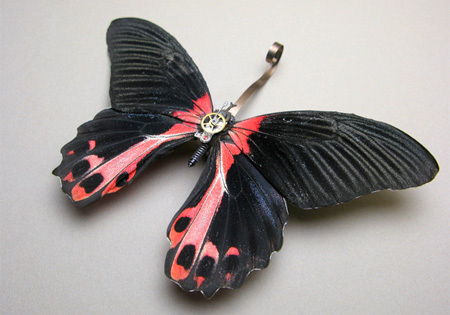 Less disturbing for those who don’t like the use of dead animals/ insects. 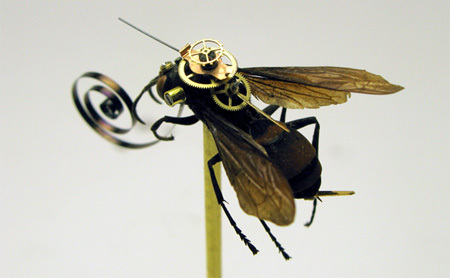 Its rather disturbing thinking of these bugs used to be alive and now turned into these kind of steampunk thing. but still these are bloody fantastic!!! I don’t think there is any moral issue with using/killing animals. After all, the first thing God did after Adam fell, was to kill a lamb to make them clothes with, and demanded animal sacrifice. Jesus helped his disciples catch a whole boat load of fish, and ate them. We should be careful of making a moral issue out of something God doesn’t. 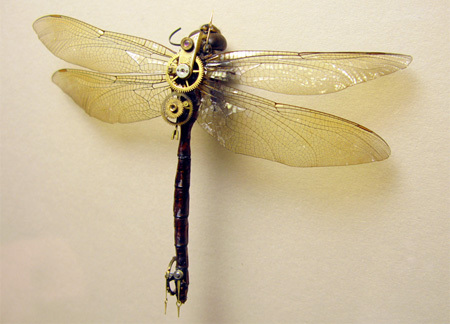 It’s art and the insects/arachnids are dead. But I must add I don’t give a damn what the Bible, or the Quaran, or any other purported holy text says about anything. 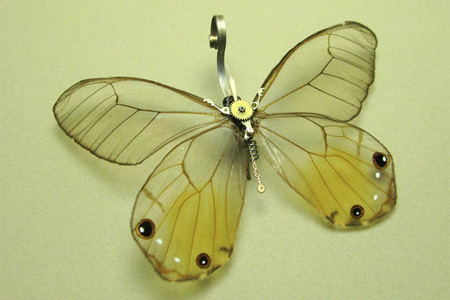 Thus I Bonnie Walters conclude that this design whatever it may be, it rox!!!!!!!!!!!!!!! Most are quite creative, I used your scorpion for one of my laptop Home screens, ( of course it has superimposed altered and mixed with other photographs) I also do not take credit. No one but me sees them. I like your work. I do not understand the negative comments.